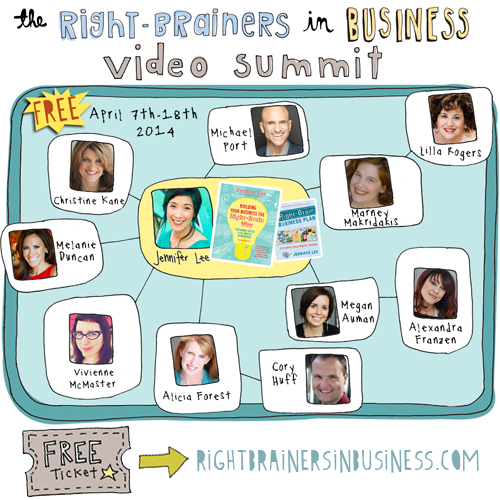 We had an amazing first week at the 4th annual Right-Brainers in Business Video Summit! We’ve been celebrating the launch of my 2nd book Building Your Business the Right-Brain Way and learning from an incredible line-up of speakers including NY Times Bestselling Author Michael Port, Lilla Rogers, Alicia Forest, Megan Auman, and Vivienne McMaster plus live Spotlights with Nicole Piar, Sarah Stevenson, and Bindi Shah. I’ve also been giving some mini-teachings around the new material in my book including highlighting some of the colorful playsheets and exercises. If you missed our free live video chat sessions or 48-hour replays, you can catch some highlights here. I’ve put together clips of some of my favorite moments of our guest interviews, so take a peek at the video above to see what you’ve missed (or to be re-inspired!). What this video doesn’t capture is the energy of the interactions when we have hundreds of creative entrepreneurs from around the world interacting LIVE in the chat room. You’ve got to experience the session live for the full-on effect (and to see all the chat names in a rainbow of creative colors)! 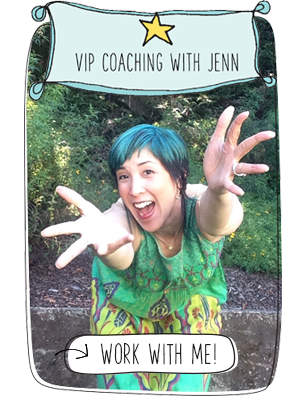 So if these videos spoke to you, imagine what it would be like to share your light-bulb moments or ask questions of me, the speakers, or your fellow cohorts in real-time. Our next session starts at 10am PDT Monday, April 14th, so check it out! I’d love to see you. You can still join us for free and catch up on these amazing interviews. During our final week of the summit we’ll have interviews with Melanie Duncan, Cory Huff, Christine Kane, Alexandra Franzen, and Marney Makridakis. Plus Spotlights with Beth Barany, Susan Miller, and Kiala Givehand. We’re also giving away more than $2000 worth of prizes throughout the whole summit!